For 200 years, India was the most valuable overseas possession of the British Empire, commonly referred to as "the brightest jewel in the Crown." Defence of the critical trade routes connecting this jewel to Great Britain fell primarily to the Royal Navy's Indies and China station squadrons. While the Indian Ocean was essentially a "British Lake" by the early 20th century, during the Great War German raiders made daring forays into the Bay of Bengal and Arabian Sea, successfully interdicting vital commerce and tying down Allied warships. 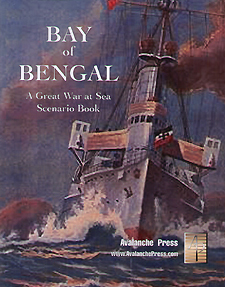 Bay of Bengal is a supplement for the Great War at Sea series that examines naval combat in and around the northeastern part of the Indian Ocean, as the British attempt to defend their colonial prize from enemies historical and hypothetical. Ten battle and 24 operational scenarios examine situations ranging from the adventures of the famous German raider Emden to pre-dreadnought era battles against rival colonial powers, and on to the possible later conflicts with the Japanese feared by some members of the British government. This supplement contains no pieces or maps, but requires ownership of Mediterranean, Cruiser Warfare, Jutland and Pacific Crossroads as well as the operational map from Second World War at Sea: Eastern Fleet to play most of the scenarios, while Plan Gold, Cone of Fire, Sea of Troubles and Black Waters are needed to enjoy them all.